Open Eye Puppet Theatre Presents Little Grandpa's Big Surprise — Eat My Words! All summer long Open Eye Theatre performs puppet shows in backyards, front yards, and parks throughout the Twin Cities, bringing communities together with original family-friendly theatre. Since 2003, the Driveway Tour has reached more than 50,000 people. This June comes Little Grandpa's Big Surprise! It's Little Grandpa's 100th birthday and everyone was too busy to remember...but not for long! With the help of her animal friends, an amazing cake recipe, and a few sneaky tricks, his granddaughter Zadie will bring the whole neighborhood together for the biggest party of the summer! 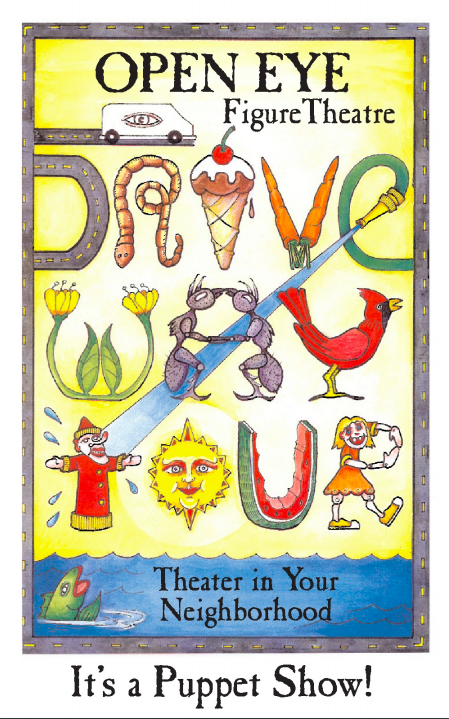 Open Eye’s award-winning Driveway Tour will be roving the Twin Cities with this all-ages outdoor puppet show sure to inspire and delight the young and young-at-heart. The performance will be outside in our driveway, weather permitting. The Wild Blue ice cream cart will be there to serve up frozen treats as well!